Wintertime droughts are increasingly common in the Mediterranean region, and human-caused climate change is partly responsible, according to a new analysis by NOAA scientists and colleagues at the Cooperative Institute for Research in Environmental Sciences (CIRES). In the last 20 years, 10 of the driest 12 winters have taken place in the lands surrounding the Mediterranean Sea. The Mediterranean region accumulates most of its precipitation during the winter, and Hoerlings team uncovered a pattern of increasing wintertime dryness that stretched from Gibraltar to the Middle East. Scientists used observations and climate models to investigate several possible culprits, including natural variability, a cyclical climate pattern called the North Atlantic Oscillation (NAO), and climate change caused by greenhouse gases released into the atmosphere during fossil fuel use and other human activities. 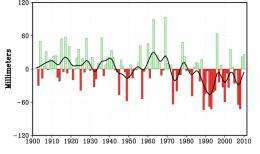 Climate change from greenhouse gases explained roughly half the increased dryness of 1902-2010, the team found. This means that other processes, none specifically identified in the new investigation, also have contributed to increasing drought frequency in the region. The team also found agreement between the observed increase in winter droughts and in the projections of climate models that include known increases in greenhouse gases. Both observations and model simulations show a sudden shift to drier conditions in the Mediterranean beginning in the 1970s. The analysis began with the year 1902, the first year of a recorded rainfall dataset. In this analysis, sea surface temperature patterns emerged as the primary reason for the relationship between climate change and Mediterranean drought. In recent decades, greenhouse-induced climate change has caused somewhat greater warming of the tropical oceans compared to other ocean regions. That pattern acts to drive drought-conducive weather patterns around the Mediterranean. The timing of ocean temperature changes coincides closely with the timing of increased droughts, the scientists found. 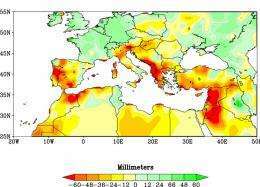 The Mediterranean has long been identified as a hot spot for substantial impact from climate change in the latter decades of this century because of water scarcity in the region, a rapidly increasing population, and climate modeling that projects increased risk of drought. Climate is a global phenomenon with global impacts on food prices and water security, and NOAA researchers are engaged in understanding changes in climate across many regions of the world. In the Mediterranean, winter drought has emerged as a new normal that could threaten food security. Lessons learned from studying climate in that region may also be relevant for the U.S. West Coast, which has a similar climate to the Mediterranean region of Europe and North Africa. climate change caused by greenhouse gases ?? Really? See recent "Candid Comments from Global Warming Scientists"
If you look at the last decade of global temperature, its not increasing. Theres a lot of scatter to it. But the [climate] models go up. And that has to be explained. Why didnt we warm up? These revelations are prompting the sciences biggest names to change their views. Whats really been exciting to me about this last 10-year period is that it has made people think about decadal variability much more carefully than they probably have before. "If you look at the last decade of global temperature, its not increasing." Now resorting to posting lies..
Venditard apparently cannot read very well. Dr. Manuel did not make the comment attributed to him by Venditard. Dr. John Barnes did. And, his chart is out of date. It ends at 2005 and it is now 2011. Earth's climate is changing, and has always changed. Earth's heat source - the Sun - has continuously changed since birth. That is why life has evolved and is evolving. 1. "Origin and evolution of life,"
2. "Earth's Heat Source - The Sun"
3. "Roots of global climate scandal (1971-2011)"
4. "Super-fluidity in the solar interior: Implications for solar eruptions and climate"
oliver, that link is true, but it doesnt support your theory at all. It does not agree all stars form on neutron star cores. I hate using this site because it is prone to errors from time to time but it does have the capabilities to show some interesting things as well. Take a look at the unadjusted HadCRUT3 data, plotted from 1950 and current to 2011. Notice the overall trends? This is the same data, this time cut down to include only the time from 2001 to the present in 2011. This prevents the data from this decade from being statistically overrun by the sheer amount of data from previous to 2001. They produce similar curves and show when the hidden cooling trend began. Yes, the cooling is statistically insignificant. Yes, statistics can be 'played with' to generate varying numbers to support one thesis or another. Fact is, if we overwhelm decadal data with additional decades of previous data, it will not allow us to see what is going on in the shorter term, which is the last ten years, unless we separate it. If, on the other hand, we run the numbers from 1950 and connect the numbers at 1998, we get a statistical OLS trend for this last decade that is a plateau, skewed by the 2010 data and, therefore, showing a very slight increase in temperature until the rest of the 2011 data comes in at current trend--definitely a sign of the apparent slowing of global warming--but still a statistical plateau. So, here is why it is important to get that data that Venditard's chart omits. Here is the data run from 2005 to the present. Interesting reference. It looks like your graph indicates a decade long plateau, and possibly a declining trend. And the downward trend looks pretty strong. It's a fun site, but you have to be careful to compare like data. And, it's easy to cherry pick for desired results. One of the problems with the site is that if you set the end point in the dataset to 2011, it actually omits part of the data for 2011! You can verify that by carefully watching the data in the chart when removing the end-point limiting. Here is the same NH data run that you did, with the 2011 limit removed. Note the Linear trend now? Now the trend is slightly downward (but still a statistical plateau) when included with the data that your setup omitted from the chart. It is not your fault. It is the site's problem. I do not know why it omits data points if one ends on an incomplete year's worth of data. You're right about the site. The best fix for obtaining accurate trends is to only use data sets from complete years. Otherwise, seasons may skew the graphs. Precisely--on all counts. Something else of interest is what this little exercise does in relation to that recent study that showed that this decade was the only time relative to the past that both NH and SH warmed at the same time, if I recalled its premise correctly. It's around on the site here somewhere. This small amount of data we have looked over (120 samples, by the way, if we remove 2011 data) may well give pause for thought for some readers as they read that study making claims that it does. The SH and NH definitely are cooling at differing rates, if we take only recent data and do not allow the sheer numbers of samples from the past to statistically overrun this decade's data. This is the sort of thing that Phil Jones described at the time of his interview, when he mentioned a statistically insignificant cooling trend within the statistically insignificant warming trend. I still am looking forward to seeing the results when all of the 2011 data comes in, though. Codspiffle(word study) I tells ya, the climate is always 'changing' that's a no-brainer, warmer oceans = higher plankton yeilds, well duh, trees consume Co2, that is their food supply, ..elementary year 5 science. The BEST project was set up 18 months ago in an effort to devise a new and more accurate way of computing changes in world temperatures by using readings from some 39,000 weather stations on land, instead of adding sea temperatures as well. But the graph drawn from "from the BEST projects data" published with Daily Mail differ strinkingly from the BEST graphs, which are published at the BEST site. Is someone able to explain this difference? Hadcrut ignores the poles. Hence it ignores those portions of the globe that are experiencing the most dramatic warming. I think you are confusing CRU with JMA. CRU does actually hybridize their data a bit by extrapolating for missing polar stations, just not nearly as much as NOAA and NASA Goddard. It is the JMA who reject non-existent data entirely. Both NOAA and NASA Goddard infill and interpolate their data but use slightly different methodologies. You can see this in a chart I posted elsewhere on this site with all four organizations. In addition, you can see how the CRU interpolated data by looking at the source code and also at the written comments on the data exposed by the so-called "Climategate" scandal. 1. Dr. Michael Crichtons speech on Environmentalism as Religion (September 15, 2003): I have been asked to talk about what I consider the most important challenge facing mankind, and I have a fundamental answer. The greatest challenge facing mankind is the challenge of distinguishing reality from fantasy, truth from propaganda. Perceiving the truth has always been a challenge to mankind, but in the information age (or as I think of it, the disinformation age) it takes on a special urgency and importance. 2. Thomas Jeffersons letter to John Holmes (22 April 1820): I regret that I am now to die in the belief, that the useless sacrifice of themselves by the generation of 1776, to acquire self-government and happiness to their country, is to be thrown away by the unwise and unworthy passions of their sons, and that my only consolation is to be, that I live not to weep over it. 4. "President Eisenhower's farewell warning (17 Jan 1961)"
Credibility in climatology will not be restored until there is a candid acknowledgement of the natural variability of Earth's heat source - the Sun - and the current state of knowledge/ ignorance about the reasons for that variability and its impact on Earth's changing climate. The site isn't perfect. However, you can choose from various data sets - most of which support the HARDCRUT3 graphs (within reasonable variances) which show, for the past ten years, the Northern Hemisphere temperatures have plateaued and the Southern Hemisphere has apparently entered a cooling trend. OmaTard has the British fishwrap Tabloid that calls itself the "Daily Mail" (Mail Online) ever published your theory about the sun being a Neutron Star made from Iron? Actually, the article appears to be genuine.